Added on October 30, 2014 by Lisa Reidy. I work with the Williams River Valley Artists’ Project (WRVAP), a collective of environmentally-alarmed Australian contemporary artists. 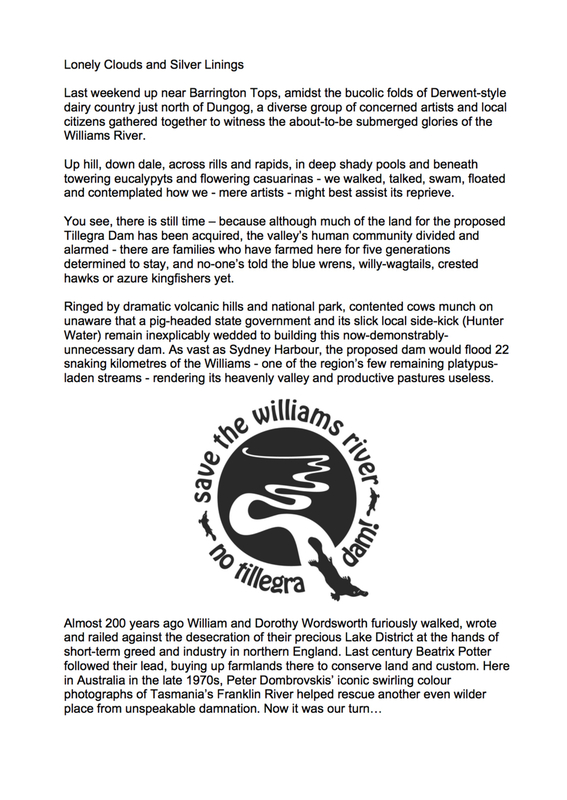 Juliet Fowler Smith formed WRVAP in 2009 to oppose an ill-conceived $400 million dam on the Williams River near Dungog, 200 km north of Sydney. The proposed dam at Tillegra would have flooded kilometres of river valley, precious eco-systems and indigenous/settler histories, destroyed the livelihoods and social fabric of local communities and wiped ‘Manns Hill’ - the property farmed for five generations by Juliet’s family - from the map. After years of sustained grass-roots opposition and a rising tide of public dismay, plans for the Tillegra Dam were eventually shelved by the NSW government in late 2010. To date WRVAP has mounted eight exhibitions (three at NSW regional galleries) and published two agit-prop newspaper/catalogues: The Stuttering Frog #1 for the exhibition Cry Me a River (2010); The Stuttering Frog #2 for Leave It in the Ground (2013). A pamphlet accompanied Instruments of Democracy (2015), WRVAP's performance + installation for Cementa15 in Kandos. WRVAP participated in BreakFree on Newcastle Harbour in May 2016, and created the anti-fossil-fuel installation While We Sleep for Gary Warner's Fieldwork: Artist Encounters show at Sydney College of the Arts, in July. williamsrivervalley.blogspot.com.au charts our regional residencies, research, exhibition, performance and publishing activities in some detail. Below is some of the work I've done with WRVAP since 2009. WRVAP is Juliet Fowler Smith, Noelene Lucas, Margaret Roberts, Neil Berecry-Brown, Suzanne Bartos, Toni Warburton, Sue Callanan and David Watson. Others including Ruby Davies, Bridget Nicholson, Bonita Ely, Ian Milliss, Christine McMillan, Glenn Albrecht, Aidan Ricketts, Jo Holder, Sharyn Munro, Julia Mullins, Colin Imrie, Ann Finegan, Graham Cochrane, Chris Ward, Tony Fuery and Denise Corrigan have enriched WRVAP’s fabric along the way. 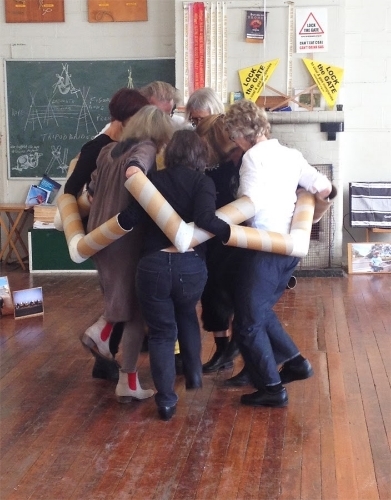 This short, empathetic performance by WRVAP artists was inspired by the courage, ingenuity, discipline and stamina of environmental activists from all walks of life 'locking-on' against new coal and CSG. The piece, acknowledging the role of witnessing in non-violent direct action, was accompanied by an installation of 40 activist portraits along with individual works by WRVAP artists. Australia Post's original Australian Navigators series (1963) featured Cook, Tasman, Flinders et al. My '21st-century navigators' are Australians putting their lives on the line against fossil fuel. Locking-on to protest Whitehaven Coal's Maules Ck mine in north-western NSW (l. to r.) are Australian rugby union legend David Pocock, fifth-generation local farmer Rick Laird, and 23-yr-old student Chantelle Brown from Wauchope. The stamps re-deploy activist images shot by Front Line Action on Coal in late 2014. Thank you David & Emma Pocock, Rick Laird, Chantelle Brown & Chelsea Miller [Chantelle locked-on to 'the echidna'] for letting me use your images. Korean-backed Cockatoo Coal) sits a sulphur-crested cockatoo. In the distance trundles a long line of coal trucks.